Having cloudy headlights is a problem that affects virtually all cars after a period of driving. It manifests by having your once clear plastic headlights looking milky and whey you drive, you notice the light from your car isn’t as clear or as bright as it used to. Why does oxidization occur on the lights? Why should you clean your cloudy headlights? Why should you let a professional clean your cloudy headlights? 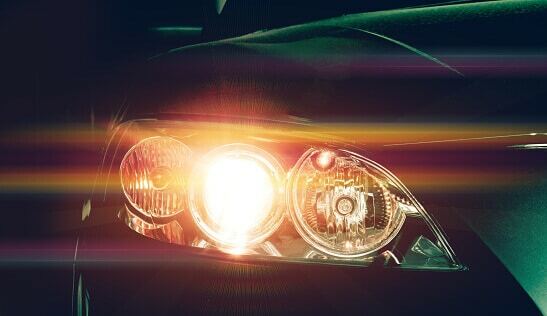 When a car is brand new, its headlights are clean and shiny. After covering 100,000 miles, they’re coated by a cloud of almost grey soot. The plastic material used to coat your headlights reacts with the sun and the varied elements of the environment in an oxidation reaction. This oxidation results in the cloudy covering that reduces the headlight’s efficiency by producing less light especially when you drive at night. If this describes your car, don’t worry. I will let you in on the steps to follow to ensure that your headlights are back to the shine and luster of the day you got your car of the yard. They’re several methods of getting your shiny car headlights back. Read on to discover how you can save money by doing them yourself at home. You can easily eliminate the effects of oxidation on your headlights using toothpaste. All you need is as much toothpaste as you use in a day for each headlight and a piece of cloth. Apply your toothpaste on a dry piece of cloth then scrub your headlights in a wax on wax off technique. Taking your time on each headlight. You’ll need a bowl and fresh running water within your reach. Now, rinse and wipe your headlights thoroughly with the wet cloth. Dry the headlights, and they’ll get back to their shiny new state. Do you need anything else after this step? Yes, some car wax. Why is it necessary? Because it forms a protective coating that reduces the amount of ultraviolet rays from the sun oxidizing your lights. Truth is, getting your cloudy headlights back to their original state is easy and does not require you to spend any money. As this problem has become prevalent, several companies have spotted the opportunity to create and sell DIY kits that clean your headlights. These kits consist of several grades of sandpaper which help clean even the most oxidized headlights, dry cloths, polish and wax to protect your headlights from the reaction with the sun once they are back to their original mode. The first step to cleaning them is determining how cloudy they are and choosing the correct sandpaper. Before you start scrubbing, ensure that you tape off the area around your headlights to avoid accidental damage while restoring the shine in your lights. Each company produces its own variety of sandpaper that’s why you should always read instructions before getting down to work. It will require that you wet sand each headlight for about twenty minutes to ensure that you get all the cloud off. Wet sandpaper ensures that you don’t break your glass as you clean it. Feel with your fingers and observe your process to ensure that every scratch and faded speck of glass is thoroughly cleaned off for that shiny new look and feel on your headlights. Keep sanding until you are satisfied that the glass is free from clouds. After sanding your headlights clean, it’s time to whip out the other items in the DIY kit. Apply polish on the glass. This will help smooth the glass and you’ll notice if there are a few specks of scratches or oxidation residues on the glass that have not been eliminated by sanding. Finally, apply wax on your headlights to protect it from the sunlight and to enhance its shine. This is another method that has been tried and tested in headlights cleaning. All you need is your favorite insect repellent, a piece of cloth and your headlights will be clean in about half an hour. While spraying the insect repellent on your dry piece of cloth, do it cautiously to avoid inhaling. Insect repellent is corrosive and will cause damage to your headlights and body of the car. Scrub the cloudiness off each headlight to dry it off. It will take you about ten minutes to thoroughly clean each headlight. Remember to apply polish and wax on the headlights. Doing this gives them a more appealing shine and protects them from harsh weather elements. Is this a permanent solution? No, because insect repellent has a short term effect on the shine of the headlights and you will have to repeat the process at least every quarter. This is a quick and effective method if you need to get rid of scratches. You will require a piece of dry cloth, glass cleaner, car wax, and polish. Cover the parts surrounding your headlights. Second, spray glass cleaner on the headlight and scrub with your dry cloth for five to ten minutes. Your headlights will end up scratch free and shiny. Apply wax and polish to enhance the shine and protect your headlights from scratches and reaction to sunlight. Oxidation on the headlights affects both the inside and the outside. All the above cleaning methods touch on how to clean the headlights from the outside. What if your problem is in the headlights? Often, the insides of a headlight are clouded due to the presence of moisture. How does it find it’s way inside? through the small spaces in cracks and panels. This moisture reacts with the light from your bulb and from the sun, causing clouding inside the headlight. To clean it, all the above methods are applicable. You only need to bring out the headlight casing from the car and clean it using your preferred method. In addition, you can dip the whole casing into vinegar. A bucket is the most effective way to accomplish this task successfully. If you bought a rebuilt title car, you will have to buy a new casing. Driving home one day, you notice that your car isn’t giving off as much light as it used to. Once you get home, you look at the headlights and you notice that they are cloudy. You get on the internet to do some research on how to eliminate the cloudiness of your headlights and come into new information on the different available ways that you can restore your headlights. You decide that you are not handy enough to make this a DIY project and end up taking your car to a professional for a thorough cleaning. Having a professional clean your cloudy headlights for you is the best strategy. Professional have lots of knowledge, experience and a range of materials available to clean and restore your headlights to their original state. For the expertise and convenience afforded to you by the professional service, you’ll obviously pay much more than the cost of buying a DIY kit. But, cheap can turn out to be expensive, so why not just get a good job done by visiting the nearest auto repair shop? Clean headlights ensure that you’re safe on the roads as you drive especially at night and during winter. In these periods, visibility on the roads decreases. Clouded headlights impact on how far the light from your car can reach. In addition, during winter, oncoming drivers can effectively see your car on the road if it has its bright lights on. Cloudy headlights dim the light produced by your car, which leads to lower visibility for your car which could lead to an accident. Cleaning your car’s clouded headlights ensures that they remain shiny and new. This helps retain the value of the car. Vehicles sold with clouded headlights tend to look much older than they really are and end up commanding a lower price than shinier looking cars. When you clean your headlights regularly, you won’t have to incur extra costs of buying headlight casing every few years. Rather, the headlight casing on your car can last as long as you want it to. All you have to do is clean it regularly for enhanced vision in the road and aesthetic values to the car. Often governments require inspection on various types of vehicles. Various facets of roadworthiness on the vehicle are inspected. Cloudy headlights may cause the vehicle to be rated as un-roadworthy. Cleaning cloudy headlights is an easy and affordable task to carry out. You can either do it yourself or have it done by a professional. It doesn’t take up as much time as major repair and is much cheaper and convenient. Professionals are best suited to handle your cloudy headlights due to two reasons. First, mechanics have to undergo certified training courses. Second, since dealing with a variety of car brands every day enhances their experience. It’s wrong to assume that you can match their experience by watching a couple of DIY YouTube videos. A professional will have much more than a few sandpaper ranges and a tube of toothpaste to clean your cloudy headlights with. Professionals have advanced cleaning technologies that not only clean and shine the headlights but also ensure that they are protected from the causes and effects of oxidation for a long while. Do you use fuel treatments? What accessories should I get for my SUV? Instead of having to spend your time researching on how to clean cloudy headlights and looking for the necessary equipment and spending time cleaning your headlights, leaving the professionals to handle it for you saves you the hassle and time that you spend in research and the actual cleaning. This is the time that you could use for something that adds value to you as an individual such as exercise. While taking your car to the professionals, you might remember another problem or touch up you require. Calling or texting your mechanic ensures that things get done quickly and affordably. Professionals will also recommend better ways to maintain your car for better use and durability. First and foremost ensure that you take care of yourself when you clean your cloudy headlights at home. Wear gloves. This will help protect your hands from the chemicals you are using to clean your headlights. Some of them are corrosive and could cause wounds or allergies for those with very sensitive skin. Ensure that you cover up surrounding parts near your headlights. The corrosive chemicals you are using to clean the headlights may mess up with the body or the paint. Use masking tape and apply several layers. Also, ensure that you avoid pushing too hard on the headlights when sanding. You could damage or break the headlights rather than clean them and end up buying a new casing for your headlights. The chemicals such as car wax and polish, glass cleaner and insecticides are harmful and some are poisonous substances when ingested. As such they should be stored away from young children who may want to play with them and swallow any of the products. Cloudy headlights are an eyesore. They make your car seem ugly, old, and neglected. At the end of the day, there are numerous DIY methods that you can use to clean the cloudy headlights on your car. Alternatively, you could opt to have a professional do it for you conveniently.